Are you considering a new and exciting career path as an LGV driver? If you have been looking for the best LGV training Southampton offers, then you need to look no further than Wayside Transport today for a highly praised, commendable and DVSA recognised company. To benefit from our wealth of knowledge and all-encompassing experience, get in contact with our well-established Southampton LGV training centre today on 01202 873 911 to inquire about any of our courses and be steered towards success. With a first-time pass rate for LGVs that is 25% above the national average, when searching for the most acclaimed LGV training Southampton facility, you’ll be hard-pressed to find a more distinguished alternative to Wayside Transport. For the essential LGV driver know-how plus a multitude of practical experience, we’re the obvious and only choice – you’ll be steered the right way with us. 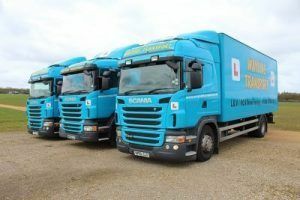 By completing our reputed LGV driver training courses, you will be able to drive a full range of large commercial vehicles and earn up to £30k a year. Did you know that increasingly, there is a demand for highly knowledgeable and expertly-trained LGV drivers? Consequently, by partaking in this course, you’ll now have access to an industry that boasts tens of thousands of jobs nationwide. With our distinguished training under your belt, you’ll never be wanting for work again – so, what are you waiting for? Your route to driving success starts right here with Wayside Transport. As specialists in LGV license training courses, all of our friendly instructors are fully NRI accredited and hold a current DBA/CRB certificate, giving you complete peace of mind. Additionally, it may be worth having a browse through our high-definition gallery to find further insight into our outstanding training programmes. From caravan and towing assistance training courses to CPC and PCV training, we’ve got you covered. Should you have any questions or queries, please do not be tentative about giving us a call today – we’d be delighted to share our wealth of knowledge with you and help you find the most suitable course for your needs and desires. Why should you choose our Southampton LGV training facility? Unlike our nearest competitors, we don’t just help you get your driver license, we’re committed to providing each client with a solid foundation for your driving career. It’s of paramount importance to us as a company to equip you with all the skills required to drive a large commercial vehicle safely and professionally for a lifetime of competent driving. Do you still need convincing that Wayside Transport is the number one LGV training Southampton facility on the market? If so, we encourage you to have to look through what our clients, past and present, have said about our reputable services. After all, please don’t merely take our word for it that we offer the best LGV training in Southampton, we’re happy to let our glowing testimonials do the talking for themselves. With complimentary feedback such as this, it’s hardly surprising that we’re renowned throughout the South of England as the best Southampton LGV training facility on the market. Why don’t you give us a call today and kick-start your dream career path now? Your search for the finest LGV training Southampton has to offer is over now that you’ve found out about the stellar reputation and distinguished services offered by Wayside Transport. Could your career be benefitted from partaking in our LGV training in Southampton? If so, you really have nothing to lose by giving us a call today on 01202 873 911. For an unparalleled service which is second-to-none across the South of England for price, customer satisfaction and excellent workmanship, we’re the only company to get in touch with today. You can register your interest in the most sought-after LGV training Southampton has to offer by either phoning us or filling out the contact form on our easily navigable website.